Two days of substantial rainfall last week did not eliminate severe drought conditions in Southern California. Much of the runoff made its way to the ocean instead of reservoirs but some San Diego residents were able to harvest water and store it for upcoming not-so rainy days. South Park resident Jason Folkman collected 650 gallons in this tank and another 900 gallons in what's called a water pillow he had installed last year in the crawl space of his home. “I felt like it was the environmentally responsible thing to do,” Folkman said. Over 1500 gallons is enough to water his three-tiered garden and green up the rest of his entire yard all summer. “Some are native some are fruit trees some are vegetables. You're getting more natural water that the plants like more and respond to better,” Folkman said. Two days of rain funneled from his deck filled the pillow, rain from his roof filled the tank. It is a system designed by architect Candace Vanderhoff. “Imagine all of the water staying on your property soaking into the ground creating this really beautiful soil,” Vanderhoff said. Vanderhoff started her rain tank company in 2009 after discovering San Diego imports most of its water. They vary in size and can even be decorative. She creates systems to collect rain water or greywater. All of it can keep landscape and lawn lush and green with barely a drop of water wasted. “Unfortunately a lot of people don't do anything until the resource is gone,” Vanderhoff said. 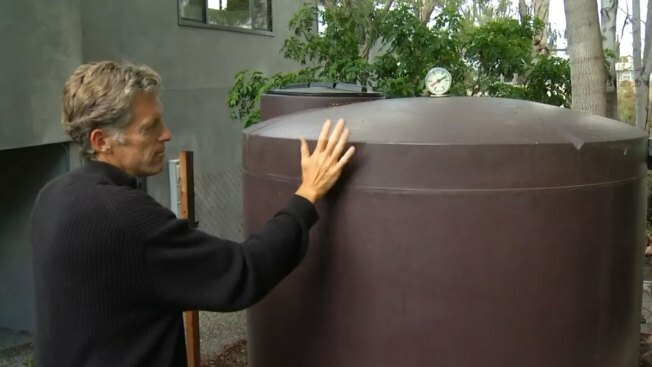 Vanderhoff estimates in a year the average homeowner could collect 30,000 gallons of water through such a system.